CIFOR’s growth has been in the double digits for the past six years and the organisation has doubled in size over the same period. For 2013, the budget is estimated at $44 million, up from $33.8 million in 2012. Per annum growth for 2012 was 20 percent and is expected to increase to 30 percent in 2013. The Finance and Administration team is one part of this growth story, putting in place policy and procedures to strengthen accountability, assisting with proposals and budgeting and supporting the expansion of CIFOR’s research into new regions. The volume of restricted funding has also been increasing over a number of years, so finance staff have been working to produce proposal budgets side by side with scientists, Tumuluru said. Moving into the era of CGIAR Research Programs, where CIFOR is the lead on the Forests, Trees and Agroforestry program, has meant that the finance team has also become responsible for funds for other research centres. They were also a critical part of the team that created the program’s proposal, which was well received by donors. Working closely with finance, the administration team ensures that CIFOR’s campus and infrastructure is maintained to international standards to create a safe working environment for all. Finance and administration staff in the regional offices also ensure all policies and processes are implemented effectively and support the headquarters based teams. The Human Resources (HR) team has also had a critical role to play in the expansion. Staff numbers have increased in line with the organisation’s growth, rising from 183 staff in 2010 to 206 by the end of 2012. This year, CIFOR also increased its presence in Southern and Eastern Africa by establishing a regional office in Nairobi, Kenya, with the support of HR. The HR team also reviewed the organisation’s staff manual, approved by the board in May, to streamline documentation and policies. In another big achievement for human resources and diversity, the gender ratio at CIFOR is now nearly 50-50. © 2013 CIFOR. All Rights Reserved. CIFOR advances human well-being, environmental conservation and equity by conducting research to help shape policies and practices that affect forests in developing countries. 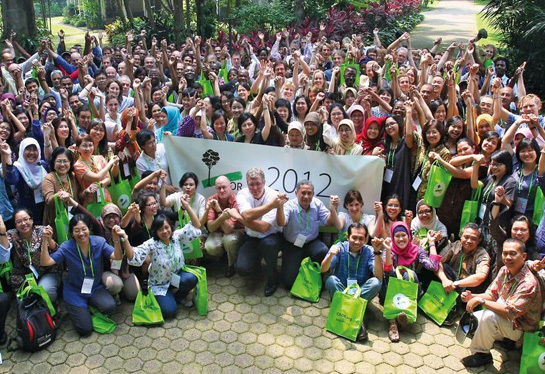 CIFOR is a member of the CGIAR Consortium. Our headquarters are in Bogor, Indonesia, with offices in Asia, Africa and South America.